I’ve mentioned before that Bart “Daredevil” Hill is a pre-existing comic book character; he was originally created by Jack Binder, and first appeared in Silver Streak #6 in 1940. We can’t give Binder all the credit for creating the Bart Hill we know today, though, since the character was substantially changed by Jack Cole for his second appearance. Jack Cole, who later created Plastic Man, was a brilliant cartoonist, one of the greats of his era. It was Cole who made Daredevil a successful character. In 1941, after Cole had left, Charles Biro took over the character, and would continue to write and draw his adventures until 1950. Which, incidentally, means that Daredevil outlived the original Flash, whose comic was cancelled in 1949. Anyway, we were talking about Charles Biro. In 1942, in Daredevil #13, Biro introduced a group of supporting characters called the Little Wiseguys. 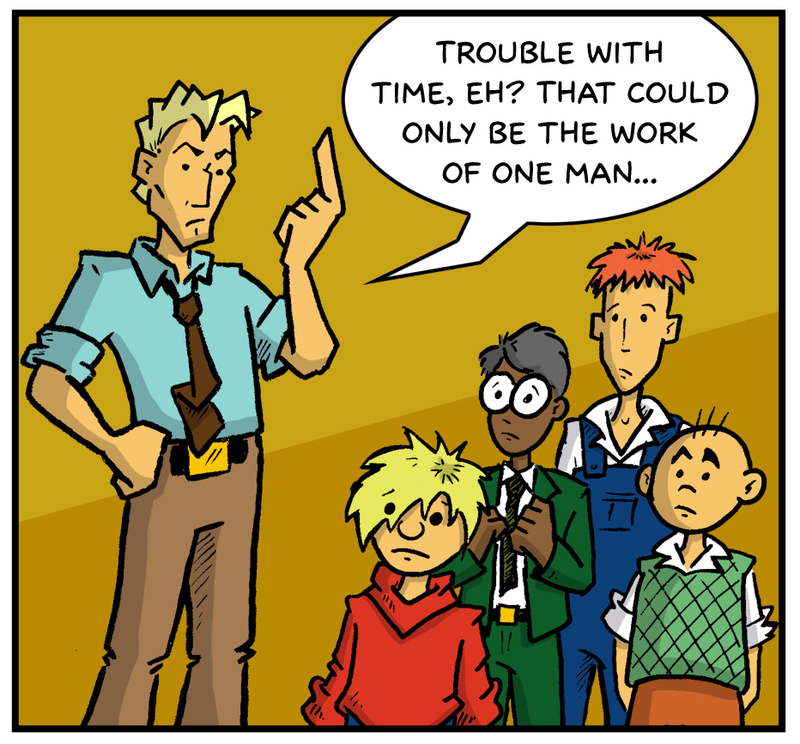 That’s them, on today’s page–Curly, Jock, Scarecrow, and Pee Wee. These characters eventually took over, reducing our man Bart Hill to a supporting character in his own comic. So obviously they’re an important part of Daredevil’s lore, and if we’re going to tell a story from his past, they need to be in it. Also, when I asked Josh to draw this comic, his first question was, “Will it have the Little Wise Guys in it?! ?” I couldn’t tell him no. You don’t have to know any of this background information to follow the story–it still makes sense if they’re just random neighbor kids who noticed some weird stuff happening–but I always like to know where characters came from, and I assume some of you do as well. And I think it’s important to give Charles Biro credit for all the quality work he did, over all those years.